It’s October of 1993 in Hawaii. A drunk driver hurtles toward a bend in the road. From the opposite direction, accomplished advertising creative and triathlete Phil Slott takes a routine drive. As he eases into the bend, he meets the drunk driver skidding into the wrong lane and, in one second, Phil’s life takes a dramatic turn. As he struggles to stay alive in the ICU, Phil’s organs, bones, and much of his brain are broken. What he and everyone else come to realize is that his creative drive and passion remain intact. And these abilities serve as the foundation for his arduous yet inspiring road to recovery. This is more than his story. Written in collaboration with his wife, Mary Spears, Damage Control: A Brain Injury Survivor Helps You Beat the Odds is a tough-love conversation and guide for those who have survived a traumatic brain injury (TBI) to help them regain hope and quality of life. From husband and wife authors Slott (Never let ’em see you sweat, 2014, etc.) and Spears, a touching, frank, and unsparing depiction of the trauma, initial recovery, and ongoing challenges surrounding traumatic brain injury (TBI). After a drunken driver nearly killed him in an auto collision one Hawaii morning, Slott spent the next few weeks in a coma, then in rehab facilities, and finally back home with his wife, Spears. Unfortunately, the accident dealt a serious blow to his brain, compromising his short-term memory, his ability to concentrate, and even the easy flow of movements and decision-making required to simply get out of bed and start an ordinary day. Slott and, in several chapters, Spears describe not only the physical challenges of working and living with a brain injury, but all the psychological battles as well. While the stated intent of the work is to address an audience of fellow TBI sufferers and their caretakers, the book’s clean prose and tight pacing make it accessible for a wider audience. Slott is careful to stay away from overt bids for sympathy, preferring instead to bolster his audience with slogans of self-improvement and unflagging belief in the ability to overcome seemingly daunting obstacles, whereas Spears provides more of an emotional grounding to each of her chapters. With tremendous honesty, she describes how frustrating it is to take care of someone who is himself deeply frustrated by his condition. Yet these accounts, always couched in deep compassion, often give way to humor. The most affecting portion of the book comes in list form as Spears describes Slott’s various recovery milestones, measured by the day they occurred after the accident. “Day 187: Solo trip to the bathroom.” “Day 215: Undressed himself.” Slott and Spears are also meticulous in their list-making of drug regimens and hospital experiences. The couple functions wonderfully well as a writing team, creating a thoroughly researched, emotional document of the incredible strength and perseverance it takes to overcome the obstacles life often places in our paths. Although ostensibly written for caretakers and TBI survivors, this compelling read will comfort anyone who needs inspiration for overcoming an incredibly daunting situation. Traumatic Brain Injury, or TBI, has been in the public eye of late, thanks in large part to the film Concussion, which brought the subject to the fore. March is Brain Injury Awareness Month, and the statistics around TBI are startling: Every 13 seconds someone in the US sustains a TBI. One in every 60 Americans lives with a TBI-related disability, amounting to at least 5.3 million people. Phil Slott is a TBI survivor; he and his wife Mary Spears have co-authored a powerful resource for survivors and their caregivers. Damage Control: A Brain Injury Survivor Helps You Beat the Odds is a self-help memoir chock full of experience, advice and hope. A top advertising industry executive of the 1980s, Slott is known for slogans like the U.S. Navy’s “It’s not just a job, it’s an adventure.” His life changed forever one October morning in 1993 when he was hit on his motorcycle by a drunk driver. Slott’s survival was miraculous, and his accomplishments in the face of the “new normal” of life with a TBI are remarkable. After six weeks in a coma and six months in hospitals and rehab facilities, Slott emerged overwhelmed and unprepared for the trials that awaited. Spears writes from a similarly unflinching perspective as caregiver and spouse. Her loyalty, dedication and fearless advocacy will inspire even the most overwhelmed family member. In Damage Control Slott and Spears offer an earnest heart-to-heart, leaving the reader with the help and hope to move forward. This book is an excellent account of the accident, the injury, and the monumental effort it takes to recover from TBI. The lessons in dealing with the health care complex are invaluable and applicable to all who are plunged into medical situations both sudden emergency and elective. Damage Control should be a must read for our wounded warriors, their medical care givers and their families. The insight Phil and Mary provide could help them all define and execute a recovery plan which leads to far greater outcomes. I applaud them both for taking the time and effort to make their story available. This book is amazing. My husband had a traumatic brain injury 11 ears ago. I got this book for him and he loved it. I believe it has helped him understand all he has gone through better. In fact he said he will be reading it again. Two thumbs up! I had a different kind of TBI. Mine was a benign brain tumor in the hypothalamus tht has caused me immense neurological problems. I wish this book was out sooner. There was a time when I was depressed and anxious. I am happier now, despite still having a physical disability. The advice and the emotions put into this book are amazing. 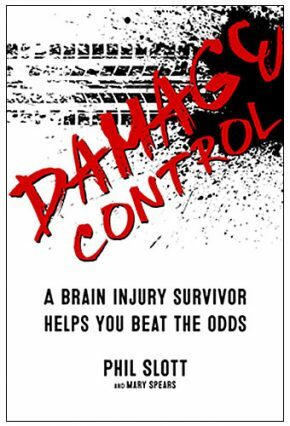 My first reaction upon finishing reading Damage Control was “Incredible!” Having read widely in the area of brain injury, I think Damage Control gives unique insight and perspective from the beginning of acute injury through the post acute rest of a survivor’s life. This is a remarkable story of the triumph of human spirit as well as a guidebook to meeting life’s challenges. Although directed to those who have suffered Traumatic Brain Injury (TBI), it has much broader application. Those of us who have Parkinson’s Disease experience TBI in slow motion and much of Phil’s guidance applies to us as well. In fact, I can’t think of anyone who could not benefit from reading this book. It is also a love story of a couple who faced unimaginable difficulties and stayed in love through it all.